Identification: Becker (1983); Page and Burr (1991); Etnier and Starnes (1993); Jenkins and Burkhead (1994). Original spelling ends in ii (Nelson et al. 2004). Native Range: Atlantic, Arctic, Great Lakes, and Mississippi River basins from continental Newfoundland (i.e. Labrador) to Mackenzie River, Northwest Territories; south to the Tennessee River drainage, northern Alabama, and Arkansas River drainage, New Mexico; south on Atlantic Slope to Santee River drainage, South Carolina; upper Rio Grande drainage, New Mexico; Skeena and Fraser River drainages (Pacific Slope), British Columbia (Page and Burr 1991). Table 1. States with nonindigenous occurrences, the earliest and latest observations in each state, and the tally and names of HUCs with observations†. Names and dates are hyperlinked to their relevant specimen records. The list of references for all nonindigenous occurrences of Catostomus commersonii are found here. Means of Introduction: Bait bucket release and trout stock contamination in Colorado. Probably as bait bucket release in Utah, and Wyoming. Unknown means in Georgia, North Carolina, and New Mexico. Woodling (1985) reported the first introductions in the Colorado River took place in the 1860s and 1870s. Holden and Stalnaker (1975) reported later introductions: one in 1926, and another in 1938. They also assumed a population in the Yampa River was from a separate introduction. Status: Established in all locations. Impact of Introduction: In Colorado, the White Sucker is replacing native suckers in the Rio Grande and Colorado river drainages (Walker 1993). 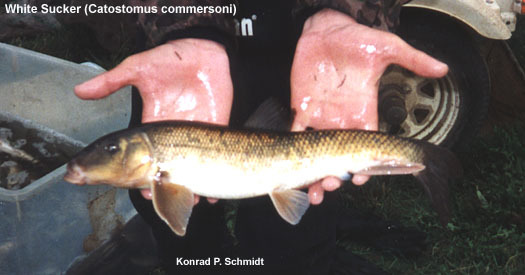 Hybridization between native flannelmouth and bluehead sucker, and non-native White Sucker Catostomus commersoni, longnose sucker Catostomus catostomus, and Utah sucker Catostomus ardens is occurring. Some combinations are fertile and will lead to introgression (Wyoming Game and Fish Department 2010). Remarks: Tyus et al. (1982) gave a distribution map of the this species in the upper Colorado basin. Baxter, G. T., and J. R. Simon. 1970. Wyoming fishes. Wyoming Game and Fish Department Bulletin 4, Cheyenne, WY. 168 pp. Couch, C. A., J. C. DeVivo, and B J. Freeman. 1995. What fish live in the streams of metropolitan Atlanta? Fact Sheet FS-091-95, National Water-Quality Assessment Program, U.S. Geological Survey, Atlanta, GA.
Holden, P. B., and C. B. Stalnaker. 1975. Distribution and abundance of mainstream fishes of the middle and upper Colorado River basins, 1967-1973. Transactions of the American Fisheries Society 104(2):217-231. Hubert, W. 1994. Exotic fish. Pages 158-174 in T. L. Parrish, and S. H. Anderson, editors. Exotic species manual. Wyoming Game and Fish Department, Laramie, WY. Nelson, J. S., E. J. Crossman, H. Espinosa-Perez, L. T. Findley, C. R. Gilbert, R. N. Lea and J. D. Williams. 2004. Common and Scientific Names of Fishes from the United States, Canada and Mexico, Sixth Edition. American Fisheries Society Special Publication 29. Bethesda, MD. Platania, S. P. 1991. Fishes of the Rio Chama and upper Rio Grande, New Mexico, with preliminary comments on their longitudinal distribution. Southwestern Naturalist 36(2):186-193. Vanicek, C. D., R. H. Kramer, and D. R. Franklin. 1970. Distribution of Green River fishes in Utah and Colorado following closure of Flaming Gorge Dam. The Southwestern Naturalist 14(3):297--315. Walker, P. 1993. A list of the endemic and introduced fishes of Colorado -- March, 1993. Colorado Division of Wildlife, Aquatic Resources Unit. Unpublished manuscript. 16 pp. Woodling, J. 1985. Colorado's little fish: a guide to the minnows and other lesser known fishes in the state of Colorado. Colorado Division of Wildlife, Denver, CO. 77 pp.